Actually I'm no longer a head of department (now Dean of Postgraduate Research and the Exeter Doctoral College), but still blogging on matters relevant to academics and students. All views are my own and not necessarily those of my employer. If you like a post, please publicize it; if you don't, please leave a comment to tell me why – Andrew McRae (http://humanities.exeter.ac.uk/english/staff/mcrae/; @McRaeAndrew). A recent HEPI report exposes the confidence trick that sustains British higher education. Research excellence leads to high international status; this in turn leads to high numbers of international students; and these students underwrite the research. Simple, but maybe not sustainable, especially in the current climate. Indeed an examination of this creaky merry-go-round exposes the risks that face UK universities. The report, How much is too much? Cross-subsidies from teaching to research in British universities, by University of Oxford MPhil student Vicky Olive, grabbed headlines for its calculation that international students contribute, on average, £8,000 per year to research funding. The author used Transparent Approach to Costing (TRAC) data (imperfect, yes, but the best information we have) to track income and expenditure, working largely at institutional level. Unsurprisingly, she found that teaching subsidises research. However, it’s almost entirely the surplus value from international students, rather than the income from home students, that is responsible for this effect. The report’s fundamental point is about the chronic underfunding of research. Research councils never quite pay full economic costs, and increasingly demand match-funding. Charitable trusts and foundations never even pretend to cover full costs; and, again, they can make some stretching demands before releasing funds. Meanwhile, start-up equipment costs, especially in STEM fields, can be prohibitively expensive for many. In the most recent year that it analysed (2014-15), the report calculates a ‘research deficit’ across the UK of £3.3 billion, or 37 per cent of research income. It recommends that the government fills this gap. There is increasingly intense competition for research resources. Successive rounds of the RAE and REF are driving universities to concentrate efforts on greater research productivity. Competition for grants has intensified as success-rates have waned. The growing trend for grants to be targeted in accordance with government policy (e.g. the Global Challenges Research Fund or the Industrial Strategy Research Fund), is prompting universities to reassess their entire operations. Universities are desperate to stay in the business of high-end research, and are stretching themselves to do so. One of the ironies of this system is that, because research so consistently incurs losses, the financial strains are greatest on the most successful institutions. The concentration of resources at a select number of universities remains a controversial subject, but in fact it’s old news. The twenty-four Russell Group universities already win 76% of all available research grant and contract income, and 68% of all Quality-Related funding (determined by the REF). Many of the most costly areas of research are already the de facto preserve of a relatively small group of institutions. And these universities, as a result, become the ones that most desperately need to recruit – and charge, at a premium – international students. ‘Cross-subsidy’, however, is an interesting idea. Some parts of university operations have always subsidised other parts. Moreover, in any business the tactical movement of resources from one unit to another is considered normal practice. 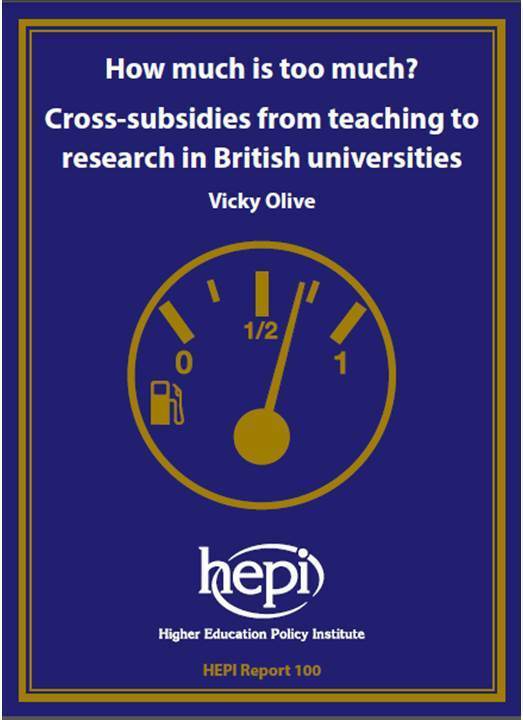 But, as ‘How much is too much?’ demonstrates, the present circumstances of British higher education are placing practices of cross-subsidy under unprecedented scrutiny. Critically, age-old tensions between research and teaching are now institutionalised in dual governing agencies: UK Research and Innovation (UKRI), and the Office for Students (OfS). And the latter – with a wisdom that remains unproven – has already swathed itself in the discourse of ‘value for money’, which impels in turn a radical unpicking of university finances. People need to know, we’re told, where every penny of those home fees of £9,250 per year actually goes. Now, as this report reminds us, it is surely only a matter of time before students from our main international markets ask their own questions about ‘value for money’, and look towards ambitious and cheaper universities at home. I don’t expect that countries such as China and India intend to underwrite UK research in the long term. So there is a lesson here about the underlying tensions of cross-subsidy: the ‘how much is too much’ question. Elsewhere on Wonkhe, David Morris argues that the report exposes a ‘dirty secret’ of universities under-valuing teaching. However, I don’t think this was ever really a ‘secret’, nor is it ‘dirty’ to want one’s university to compete in the expensive, noble business of research. There is real value, for everyone, in universities producing world-leading research, as British universities are doing. But there is also value in appreciating the divergent interests of different stakeholders. Trust matters. I also wonder whether there is a lesson about what Billy Bragg once called “the temptation / To take the precious things we have apart / To see how they work”. Britain did a lot to establish the prevailing international model of the university, as an institution in which research and education co-exist, not always easily yet almost always creatively. Across the world this model is flourishing, and attracting heavy state investment. The international league tables which have assumed such prominence in recent years are derided by many, yet their attention to ‘reputation’ underlines an essentially conservative conception of what a university actually is. That’s one reason why, for the time being, British universities do so well in these tables. So what happens when we take liberties with this model, under-funding research and exploiting the desperation of universities to stay in the game? And what happens when we pick it apart, tracing every incoming pound and every TRAC-hour in the interests of ‘value for money’? Maybe that confidence trick I mentioned above, which is fundamentally a story of success, starts to look a bit rickety. Maybe British universities as a result lose some of their reputation for quality in both research and teaching. And maybe we will find that the idea of the university might be easier to pull apart than to put back together. This post makes some very important points about how research – especially in the sciences – is so underfunded in UK universities that it can only be sustained by cross-subsidy from teaching income mainly generated from other subjects.